1. Do not tag your request posts until after the request is filled. Once it is filled, you can edit your post and add the tags while you download the music. It's not that hard to do and will help the community a lot. 2. When you create a tag, make sure the spelling is CORRECT. 3. Include the all of the artist's information (first and last name, special characters, etc). 5. DO NOT TAG YOUR ENTRIES WITH "!request." It is obviously a request, it's being posted in this community. 6. If your artist has "the" before their name, use it. 7. If your artist has "and" in their name, use the & symbol OR the existing tag (even if it's 'and'). 8. No bashing the music taste of others. For you guys! Many of these are club/house type songs, but they're all worth a listen. Of course some Soulja Boy and Cali Swag District so you can learn how to Dougie lol. If you guys have any of the songs I'm requesting I'll be grateful! Comment if you guys take anything so I know what you like more of. Thanks in advance! Mods I couldn't add a tag for the following, kaskade, edward maya, dj deyde, pitbull, cali swag district. Thanks! Looking for a few songs. I am looking for a few specific songs. If you only have the whole album, that works too! HI! Would anyone happen to have the new Repo Men (2010) Soundtrack? Anyone have These Animal Men – Flawed is Beautiful? Would you like to affiliate with yousendit_? 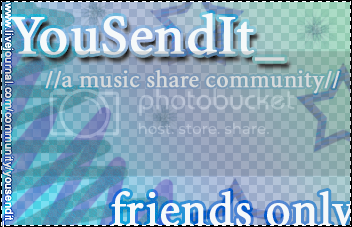 Welcome to yousendit_, a music share members-only community. This is a community dedicated to posting your own music and requesting other music, using YouSendIt.com. Feel free to upload songs and link them, giving a small description, and also including the title and artist. You may also upload .zip folders with more than one song. 1. To be a member of this community and see posts, simply join and add yousendit_ to your friends list. 2. Which goes to say, please make your posts friends only! All posts are now friends only on default.